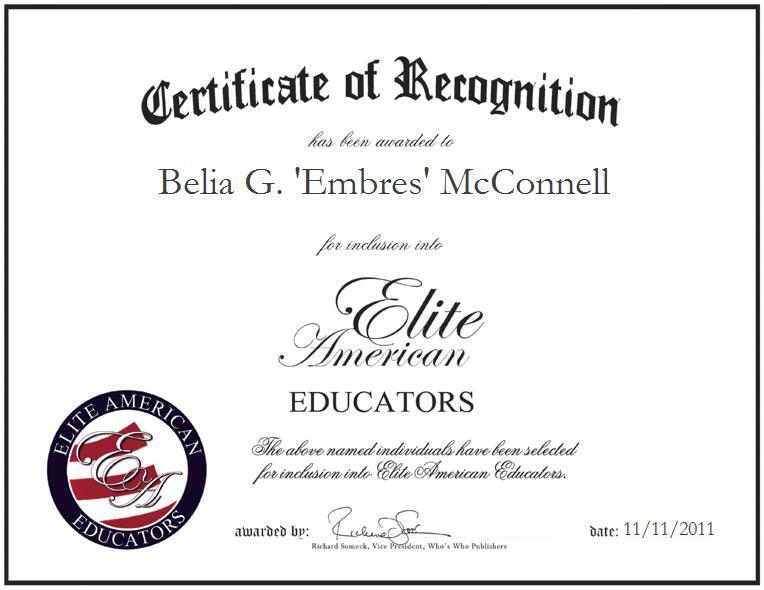 Belia G. ‘Embres’ McConnell is a retired teacher who specializes in the field of education. Prior to her retirement, Ms. McConnell taught elementary students and trained elementary student teachers. She worked with children, teachers and parents, and all the while, focused on the power of positive thinking. As a mentor to those with whom she worked, she remained committed to helping people to understand the magnitude of maintaining an optimistic viewpoint throughout their lives. She is a recipient of the Outstanding Teacher Award as granted by Wilmington Park Elementary School, and she has also received recognition for professional services from the University of California and Who’s Who Among American Teachers. She feels that sheer determination, flexibility, and a genuine ability to build authentic relationships with an array of ethic groups and support positivity has separated her from others in her field. As a cancer survivor, Ms. McConnell enjoys working with children and adults to inspire them to improve society. She has visited Europe, Mexico, Alaska, Japan, South Korea and Hawaii. The power of positive thinking has been an asset to her making each and every day worthwhile. She notes that she wakes up everyday being thankful for life and striving to make that day worth living. Ms. McConnell is proud of her dedication, upbringing, hard work and passion for the teaching profession, all of which have served as major components of her success as a professional. She also feels that the support that she has received from her family has helped her throughout her journey toward success.